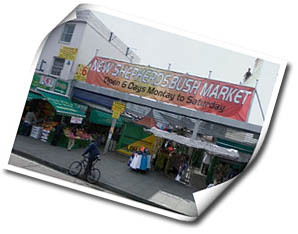 Dating back to the early part of the last century, Shepherd's Bush Market stands on the East side of the railway viaduct between Uxbridge Rd and Goldhawk Rd. Serving both the local Irish and Afro-Caribbean community, it's a good place to head for music CDs, fresh and cooked foods, yams and other exotic fruits plus household goods and furnishings. Open 6 days a week, check below for opening times. Whilst in London why not visit the World Famous Portobello Road Market!